MSI today presents a duo of laptops which are based on the AMD’s new generation dual core E-350 processor, the new 12-inch Wind U270 and the 13.4-inch X-Slim X370 notebook. The MSI Wind U270 is sheathed in color film print that protects against smudging and wear, it is less than one-inch thick and weighs 1.3 kilos. 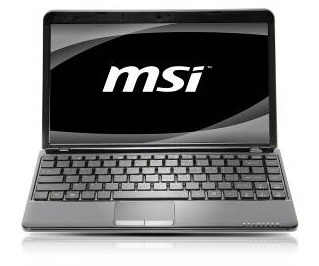 It is equipped with 12-inch 16:9 ratio display, AMD dual core E-350 processor and Radeon HD 6310 discrete class graphics display chip, USB 3.0 ports, MSI i-charger, 720P HD webcam and comes with MSI’s own ECO power-saving technology. The 13.4-inch X-Slim X370 has similar specs, weighs 1.4 kilos, features MSI’s crystal diamond seal technology and has color film print coating. Unfortunately MSI didn’t reveal any specific info about RAM, or hard drive size, and no pricing or dates either.